Welcome to our 11th Annual Coast and Marine Structures Summit 2019! 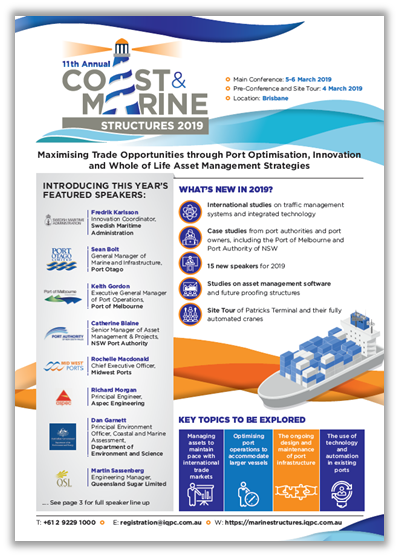 The 11th Annual Coast and Marine Structures Summit is set to return in 2019 with a brand new speaker panel. We’re exciting about this amazing opportunity for you to network with some of Australasia’s largest port authorities, government bodies and maritime engineers! The 2019 summit will delve into the new strategies that port owners are implementing that will cater to the increase in larger vessels, faster trade output and overall growth.